The Outbound 46 Plus is the result of 10 years of refinement of Carl Schumacher's legendary performance cruising design and adds several performance enhancing improvements including a Hall carbon fiber mast with rod rigging, Leisure Furl boom and dual Hood Vektron headsails with 185% 7 oz reacher and 115% working headsail. WHIM is the boat that defined the 46 Plus and has been immaculately maintained and lightly used summers in Maine. She is set up for extended cruising but equally suited for an easy daysail. The interior below is light and open with two double cabins, two heads and a large dinette. Every detail on the boat is well thought out and executed and WHIM needs to be seen to really appreciate her condition and features. West Florida Yachts would love to guide you through a personal showing of this 46' Outbound 46 Plus 2010. 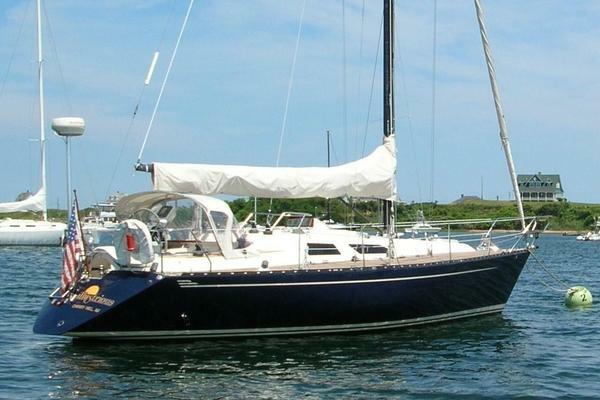 This yacht for sale is located in Portland, Maine and priced at $550,000. For a showing please contact us by filling out the form on this page and we will get back to you shortly! WHIM has been lightly used summers in Maine (under 500 hours on engine!) and stored inside a heated building when not in the water and has been immaculately maintained. In the water and fully commissioned, she is ready to go for her next owners. Stainless steel grab rails within continuous reach along cabin top. Four stainless steel dorade vent guards and cowls mounted on molded deck boxes. Easy deployment stainless steel dinghy davits. Stainless steel swim/man overboard boarding ladder. Large bow sail/deck gear locker with watertight bulkhead and easy access to anchor rode. Life raft stowage box (30”x16”x12”) with life raft under helm seat for easy deployment. Recessed engine control in seat back adjacent to pedestal controls, acrylic cover. The interior is finished with satin varnished teak trim and bulkheads with white cabin liners and overhead with a traditional teak and holly cabin sole. Large fixed portlights in the galley and main saloon let in natural light and views of the outside while overhead hatches (with teak framed screens) and opening portlights in the forward cabin and over the nav station provide excellent ventilation and additional light. The two cabin, two head layout has the galley and nav station immediately to port of the companionway with access to the sail locker aft (which also functions as a work room). Opposite to starboard is the aft head with separate stall shower and the aft cabin. Going forward, the U-shaped dinette is forward of the galley with a table that lowers to create a coffee table or additional sleeping berth. Opposite the dinette to starboard is a sleeping length settee that has been customized to for better ergonomics sitting and incorporates a fold away drink table in the middle with liquor storage behind seat back. Forward past the main bulkhead is the forward head and master cabin with center line queen berth. A watertight bulkhead separates the forward cabin from the forepeak forward. Large fixed portlights with curtains bring in abundant natural light. Polished Corian countertops with Corian fiddle. Raritan Elegance electric toilet with multifunction smart switch. Marinco 110 volt / 30 amp shore power cord and deck fitting. Balmar Duocharge for automatic house and engine battery segregation.